Today, Google rolled out the official build of the latest Android P firmware. The software giant also revealed what the P stands for; which is “Pie”. So the latest build for Android 9.0 Pie is now available for download for various Android devices including the Google Pixel series, Essential Phone PH-1, Xiaomi Mi Mix 2S, OnePlus 6, Nokia 7 (Plus), OPPO , Vivo, and more. The AOSP sources are also being updated to Android 9.0 Pie as of now. So it won’t be long before your manufacturer releases Android P for your device as well. The first set of manufacturers to roll out the 9.0 Pie update are OnePlus, Sony, Xiaomi, Nokia, Vivo, OPPO, and Essential. So download the OTA updates, factory images, or full stock firmware update and install it on your device. 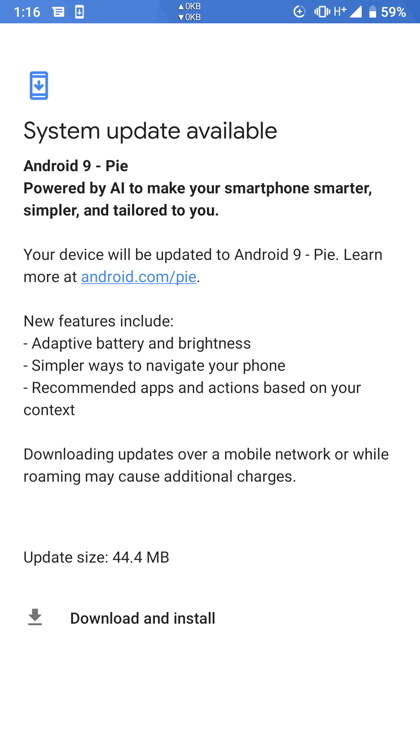 The latest Android 9.0 Pie features Adaptive Battery for prolonged battery life, Adaptive Brightness, Shush, new Google Assistant update with voice calling technology, new system navigation, Smart Text Selection, Slices, App Actions, App Timer, Wind Down, DNS over TLS, and much more. The stock Android P Launcher features new system navigation called navigation gesture pill or swipe gestures, introduction of the new Home button or home pill, and more. How to Update your Android device to 9.0 Pie? Before we begin updating, lets see which devices are receiving the new official Android P OTA update. The OTA update is currently rolling out for Google Pixel (XL) and Google Pixel 2 (XL) devices running Android 8.1 Oreo or the Android P Developer Preview 5 (Beta 4). Following are the direct download links to the Android 9.0 Pie for devices running official Oreo. If you have rooted your Android device, then you will not receive the OTA update. Here are the factory images. Read: How to install Factory Images? Google announced that the Android 9.0 Pie will not only be released for all the Google Pixel series devices, but also for phones from other manufacturers. This includes Essential Phone, OnePlus 6, Sony Xperia XZ2, Nokia 7, Xiaomi Mix 2S, Oppo R15, Vivo, etc. If you get the Factory Image, you can follow this tutorial on how to install Android P on Android phones. Installing Android P has become possible due to the introduction of the Project Treble this year. So you can simply flash a Generic System Images (GSI) of the latest available AOSP build onto your Project Treble supported Android devices. So for thoseof you who are already on the Android 9.0 Pie firmware update can Sign up for the Android Digital Wellbeing Beta. You can visit the website listed here or simply download: Digital Wellbeing 0.2.207075825 beta APK. This features phone usage details, App Timers for limiting app usage by you, a new option called “devices down” which is basically a Do Not Disturb mode to prevent interruptions, and finally a new Wind Down option to help you disconnect at night.